1789 French Revolution spoke eloquently for “fraternity, equality, and liberty.” Their voice was raised in unison for human alleviation from the insufferable of the cult of the past. The blood that ran in Paris streets ran because of the tension between Conservativism and Liberalism. The 19h century revolution was heralded by such prophets as Darwin, Comte, and Marx. By 1848 the intoxicating nectar of industrial victory had inebriated all of “Christian” Europe. The strongholds of reaction had fallen! New social structures were to arise. 1830-1871: Bourgeoisie Liberalism triumphs though Industrial Revolution. No conservative society had ever produced so much in such short time as did 19th century. The First Industrial Revolution produced a wave of opti­mism which heavily influenced developing philosophic, scientific, sociological and other paradigmatic revolutions (progress/development/evolution). Individual man’s rational freedom became enthroned not only as an end in itself, but also as the master key to society’s achievement. But in front of this silver lining was a cloud. The effect of the Industrial Revolution on man was terrifying. S/he was dehumanized. The new economic and political man was alienated by his act of production. The First Industrial Revolution occurred primarily in England; the Wesleyan revival alone saved England from the moral and spiritual decadence created by the coming of technology and a new power class, the laborer (cf. Timothy Smith, Revivalism and Social Reform). 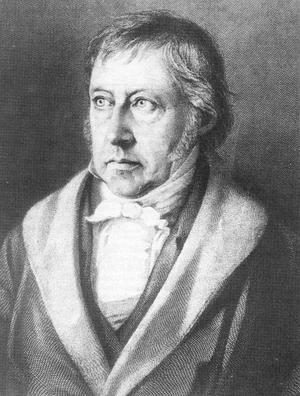 1770 (August 27): Georg Wilhelm Fredrich Hegel (1770-1831). Oldest child of a minor state official; early scholarship is not remarkable. Interested in history, Greek and Latin literature and theology; began a notebook of copious quotes. 1788 Entered Tubingen (18 years old). It was the wish of his parents that the family should produce at least one preacher. 1790 PhD in Philosophy. Graduation requirement: to write a book and defend it. 1793 Worked in the area of theology. Very unsuited. Certificate from this period indicates that Hegel was talented, but was “mediocre in industry, knowledge, and speaking and philosophy.” Holderlin and Schelling – read Kant and Plato together. Known as “the old man” (students entered university at 16 or 17; most did not make it further). 1797-1800 Tutored in Frankfort. Hegel did much writing and studying during this period; many partially completed manuscripts on religion and economics; attacked Christian orthodoxy; wrote Spirit of Christianity, published in 1917. History and religion dominate in Hegel. 1800 First systematic statement of his philosophy. 1800 Joins Schelling at Jena (golden period of Jena is over); becomes Privatdocent at the university. Dissertation “On the Orbits of the Planets” (Celestial mechanics; Newton/LePlace) German awareness begins. 1801 Late afternoon 1ecturs on logic and metaphysics, eleven students. 1803 Journal of Critical Philosophy – collaboration with Schelling; Hegel seems at first to be following Schelling, but makes a brak with him. 1807 The Phenomenology of the Spirit. 1811 Married and had two sons (another “natural” son was born in Jena). 1817 Encyclopedia of Philosophical Sciences. 1818-1831 Professor at Berlin; recognized leader of philosophic thought in Germany; popularity continually increased during these years. 1821 The Philosophy of Right; from this point on he dedicated himself to his lectures which were later published. 1830 Became rector of the University and was decorated by William III of Prussia. 1. Original History. Characterized by brief intervals between event and historical record. Often contemporaneous with the historian. History of this nature carries with it the spirit and life of both event and contemporaneous author. 2. Reflective History. An effort to contextualize history in a greater whole, to visualize one’s part in history. a. Universal History. Survey of a people, country, or the world (pp. 5,6; 6-9). Larger than original history (e.g. Israel’s history). b. Pragmatic History. For Hegel the past has no moral basis for the present (pp. 7-9, 10). Cf. collapse of biblical canon and authority in European thought within 50 years. c. Critical History. Evaluation of truth/reliability of narrative; not history per se (pp. 9;11). d. Conceptual History. Theme histories (art, religion, law) came close to universal history, but not large enough. Themes artificially imposed on events/actions.(pp. 9-10, 12; cf. Hegel was the fountainhead of comparative religion, history of religion, critical historiography; Wellhausen et al were Hegelian, etc. ; cf. trajectory of academic Antisemitism from Luther to German historical criticism). 3. Philosophical History. Meaning and interrelation of events is not external but internally woven by the intrinsic movement of the Idea in history (pp. 10, 13; removes supernatural). a. The purpose of history is development (pp. 68, 95, 70, 99). b. Meaning in history is found in development (pp. 69, 70, 98). For Hegel anything new was immanent in the past (removes supernatural). c. Development in history is optimistic, towards “perfectibility.” This is in contrast to a mechanistic view of nature that runs incessantly with no creativity and newness. Creativity is found in the Spirit’s movement in new cultures (pp. 68, 96). d. The end of history is contained in the possibility of the Spirit’s essence according to dialectic. “That which contains at as urge within itself” (pp. 70, 71; 100, 101). Compare classical liberalism’s inevitability of progress contra the Christian doctrine of sin, e.g. capacity to corrupts/misdirect progress, politics, application of science (doomsday weapons) etc. a. No history exists before the actualization of Spirit in the State (pp. 74, 104). b. Culture of history of peoples prior to statehood is “pre-history” (pp. 74, 105). c. History is not the record of familial, patriarchal events (pp. 75, 105). d. A people’s knowledge (Vedic, Buddhist, Hebrew) of its original knowledge of God before intellectual dimming and perversion do not constitute history (pp. 71-74, 103, 103). a. The World-Spirit is exhibited in the spirit of people as states reaching their development, then perishing once the “goal” is reached. They are but one epoch in the Spirit’s movement (pp. 78, 79, 111). b. As the national spirit reaches its purpose, another “higher” universal epoch is reached by the Spirit. Each epoch is as a Phoenix – following its destruction, another arises out of the ashes (pp. 87, 120). 2.Reality has its being and substance in Absolute Reason (pp. 11, 14). 4. Reason bridges the gap between the infinite and finite. Hegel attempts to bridge the gap between the subject and object (pp. 13-15, 18, 19). 5. Reason rules the world through “religious truth.” e.g. Providence (pp. 14, 15, 19). 1. History takes place in Nature/Spirit. Hegel differentiates between.physical time and time of consciousness. (pp. 20, 26). 2. The Idea wills. Idea is the same substance as the will of God. (pp. 21,22,30). 1. Freedom is dependence upon nothing else. (pp. 22, 23, 32). 2. Freedom is the essence of the Spirit. (pp. 22, 23, 32). 3. As Freedom (dependent on nothing else), Spirit has essence being in itself, self contained existence. It “comes to itself, produces itself, makes itself.” (pp. 23, 24, 33f). 4. This self-contained existence is the same as consciousness/knowledge of self. (pp. 22, 23,32). 5. Freedom is the end of history, the self-contained Idea (God) seeking to know itself. It is men’s consciousness that they are free (pp. 24, 25, 34, 35). a.This Freedom is internal, its means are external. (pp. 25, 26, 36). b. Its Means are men’s activities of will, evil, passions, private aims, selfish desires. (pp. 25-29, 36-41). c. Specific individuals are “world-historical individuals” (pp. 38-43, 54 ff). Spirit is the “innermost soul of all individuals.” (pp. 40, 56). d. World-historical individuals satisfy both themselves and world history. Man’s activities unconsciously achieve more than their in­tentions – namely the conscious purposes of the Spirit (pp. 43, 60). They are unhappy and expendable like hulls “falling off kernels” once the conscious purposes of the Geist are ful­filled. (pp. 41, 57, 43, 60). e. The individual’s morals are acted out within the dictates of the entire moral system of his culture, “But each individual is also the child of a people at a definite stage of its development” (pp. 37, 38, 52). f. The content of the moral system arises from the Idea’s dialectical movement. (pp. 38, 53). g. Content not only has its source in Idea, but it changes along with the Idea. The new moral universal is “potentially present, not actually present.” (pp. 38, 53). h. Moral content changes with the Idea and is destroyed by world-historical individuals. (pp. 38, 39, 54). No absolute good or evil. 1. The State is the external realization of the Idea. (pp. 50, 1, 70-72). 2. The State is not necessarily political but the spirit of the people; their consciousness, their truth. It is the external moral life of the people. (pp. 52, 53, 73). 3. The State is larger than the will of the individual (pp. 49, 50, 69). 4. By obedience to the whole, Freedom is found. (pp. 49, 50, 69). 5. The whole is the law even over the consensus of the majority (pp. 53-56, 75-78). 6. Freedom is not found already inherent in man by nature limited by the state, nor by self-renunciation in external familial structure, but in law/constitution (pp. 53-56, 75-78). 7. ‘The constitution is formulated on the basis of a people’s spirit, art, philosophy, imagination, climate (pp. 59, 60, 83). 8. As the culture changes so does the Constitution. “A Constitution is not a matter of choice but depends on the stage of a people’s spiritual development (pp. 60, 83), and “Constitutions give us no universally valid basis” (pp. 61, 85). 1. The idea of Freedom as the end of history and the means of its realization (subjective will and passion of ind­ividuals) are both united in the State. Freedom is found in the state while passion or will are subordinate to the consensus of the majority, law, and the Constitution of the State (pp. 62, 63, 86). 2. The Idea is expressed in the form of the State and the State’s divisional “forms” of religion, art, philosophy and morality (pp. 66, 93). 3. Religion becomes morality. Morality and the State are unity of subjective individual and general will (seen before in Law and Constitution). Both religion and morality are forms of national attitudes (pp. 62, 63, 86). 4. Religion is the reasonable consciousness of the people. that seeks to unify the universal and particular. God is “transcendent” over the particular and “immanent” in the particulars (pp. 64, 88). 5. Religion is the basis of the State, this understanding of unity (pp. 65, 90). 6. From the nature of religion and the morality of the people arise the State and Constitution. (pp. 66, 67, 93) The Spirit of the people/State is thus represented by religion, art, and philosophy (pp. 66, 67,93). 7. National Spirits and their “definiteness” of art, religion, philosophy, science are changing forms of the Spirit in history (pp. 67, 94). a. The State, for Hegel the perfect embodiment of the Spirit or Divine Idea as it exists in history on earth. The State for Hegel is God. Moses had taught that society was not a law unto itself, but was accountable to the laws of God, a radical idea indeed in and age where the State and its gods were universally viewed as one. Hegel’s view in this respect is a turning back of the clock to ancient Near Eastern models rather than the historically discernable onward evolutionary advance of the zeitgeist he claimed. b. Optimistic view of man’s perfectibility and “onward and upward” evolutionary thesis (compare 19th century protestant liberalism’s emphasis on the progress and perfectibility of man) ran aground along lines foretold by Nietzsche, who predicted the 20th century would be the bloodiest known to man. A century which saw two World Wars, massacres of populations exceeding the half-billion mark (Mao, Stalin), ecological crises, evolution of new technologies whose dark sides at least equal their bright sides (nuclear, biological, chemical, nanotechnology, cybertechnology, etc) all show man’s fall and the world of sin and death to be irrefutable presuppositions of our time. Hegel’s philosophy of perfectibility stands refuted on historical and empirical grounds. “Nor is there any reason, if reality is timeless [as Hegel, held], why the later parts of the process should embody higher categories than the earlier parts – unless one were to adopt the blasphemous supposition that the Universe was gradually learning Hegel’s philosophy” (B. Russell, A History of Western Philosophy, p. 735). c. Providence as Hegel understands it is limited in its universality; its primary sphere is the advancement of humanity). It is exhibited merely in plants, animals, individuals and a few pivotal events, “When for example, an individual in great perplexity and need gets unexpected help.” The Newtonian World Machine model left few chance events and data outside of its umbrella of regularities. Hegel attempted to save any talk of Providence by attaching it to Reason’s work in history. Transcendence and a personal God with value for the individual, however, are lost (pp. 15, 20, 18, 24; cf. Kierkegaard’s existentialism was a reaction to Hegel; on his tombstone the inscription reads “That Individual”). d. Only omniscience can devise a system encompassing all the world, as Hegel attempted to do. One cannot know the Geist is working through them. “The Idea is what Hegel happened to believe. The whole course of the universe is making it just such as Hegel thought it was” (Russell). a. History for Hegel is a determinism of thesis, antithesis, and synthesis (intellectual, logical, historical, and cultural determinism). It might seem paradoxical in such a context to speak of freedom, yet Hegel does. As Russell so poignantly observes, “Hegel uses freedom in a very peculiar sense. Freedom is the right to obey the police.” Hegel denies the reality of perfect or pure freedom; freedom such as we have it exists in a spectrum between pure despotism and anarchy. Hegel’s assertion that there is no freedom without law sounds like the Psalms of David, albeit the latter paradigm would repudiate the source of law which brings freedom being the state, or the pantheistic zeitgeist. If this thesis is not sustainable, how will we maintain, as was argued at Nuremberg after the Nazi atrocities, that there is a higher law than the law of a State? (the legal defense at Nuremberg argued unsuccessfully that the defendants were only obeying the laws of their State). b. Marx derived his own historical determinism out of Hegel by only a few small but significant alterations. Hence Hegel’s nations becomes classes in Marx; Hegel’s Idea is replaced by methods of production. Hegel and Marx are otherwise virtually identical in most important respects. c. Kierkegaardian vs. Hegel on freedom. a. The dynamic (i. e. Dialectical) movement of the Geist in history permeates all categories of Hegel’s philosophy (zeitgeist of the times). Its progression leads to new and changing national-spirits, whole cultures, laws, institutions, religions: moralities, etc. Nothing is permanent (cf. Heraclitus’ River). There is no universal moral standard/content except found in the Idea, in dialectic movement. Cultures and their moral bases represent vacillating moral Phoenixes. With so many categories of today’s society in transition (information, education, science and technology, morals, place of residence) it is all to easy to uncritically swallow the Hegelian thesis of universal historical relativity (Sociology of Knowledge Thesis). In our world of ubiquitous change and diversity some things do appear perennially (e.g. C. S. Lewis, The Abolition of Man; Mircea Eliade, The Myth of the Eternal Return: Or Cosmos and History; cf. cultural universals posited by various scholars). The fact that cultures do differ in many respects (cultural relativism thesis in anthropology; contra ethnocentrism) is a separate question from whether they ought to differ whether the question is regarded as subjective (postmodernism), objective (evolutionary ethics, divine command morality, medical models of health, etc.) or some combination; though cultures differ no culture ever known has claimed everything is the same, or that everything is good and nothing bad, or vice versa; in fact no one can accept anything and everything which may be done or conceived: relativism is always hypocritical whether in worlds real or ideal. 3. Hegel helps formulate the question, “How does a historian in a later epoch of the Idea’s movement understand the events of earlier periods under his relativity thesis?” The his­torian transcends by entering into the “spirit” of the time investigated. 4. An Absolute goal of history is inconsistent with pantheistic philosophy. Indeed history itself becomes problematic in Hegelian philosophy, for there can be no phenomenological access to creation or consummation (cf. linear, teleological history presupposes origin/goal; cf. Eliade, Mircea, The Myth of the Eternal Return: Or Cosmos and History). Emphasis on self-identity/ class identity comprise the application of “scientific method” to political structure; instrumental in the division of Europe. No nationalism before the 17th century.